The City Parks Department has received a grant to design and construct a new trail from Gubler Park eastward along the Lava Flow Wash behind Harmon’s to the existing trail adjacent to Pioneer Parkway. 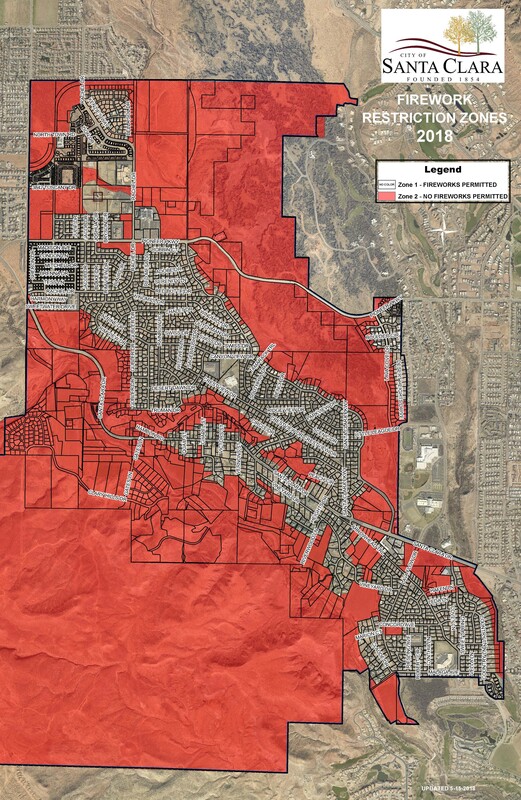 When completed, the project will create a continuous trail network from the Ivins Border at Hamblin Parkway to Gubler Park & Lava Ridge Elementary School to the Arboretum, Canyon View Park, Snow Canyon High School & Middle School and terminating near the St. George Aquatic Center in St. George. This trail offers some exceptional views of Snow Canyon, the lava flows and is heavily used by city residents. Trails are great community amenities and the City is always looking for ways to expand these opportunities to connect neighborhoods and residents to local destinations and recreational sites. The Parks Department is also working with the BLM for a land grant for a new recreational/adventure park in the South Hills. This facility will provide access to the very popular hiking, ATV and mountain biking trails in the area. This area has exploded with users coming from across the country to ride these amazing trails, many of them located within the city limits. The new park will offer additional outdoor recreation and educational opportunities regarding the unique environment of the South Hills. The BLM is taking public comments regarding the potential park and land grant so watch for the request for comments. Visit the City website at sccity.org to stay informed regarding upcoming events and public hearings. The street slurry seal project finished up in May and many streets throughout the City look much better as a result. A big thank you to all residents for their cooperation during construction and to the City Public Works Department and American Pavement Preservation for their efforts. The City has a pavement management plan in place to complete similar work on every street throughout the City every 5-7 years. This important street maintenance can extend the pavement life and keep our streets in better condition. How-ever, some streets have deteriorated to the point they need to be totally reconstructed costing up to ten times more. The City Council and Staff continue to examine all options available to fund necessary street improvements in the community. The City is considering a proposal from the Santa Clara Ivins Public Safety Department to implement a new comprehensive and inclusive emergency preparedness education effort in the communities. The pro-gram would provide training to establish a community-based organization of neighbors and friends joined together as independent preparedness groups. The training encourages the concept of ‘Neighbors Helping Neighbors’ intended to help those who are interested become better prepared for a major emergency. This community is not immune to natural disasters and emergencies; and having citizens prepared and equipped to help their neighbors can be critically important. Stay tuned for more details and information on the training program. Congratulations to all the recent high school and college graduates from Santa Clara. Hopefully you will be spending the summer preparing for college, missions, trade school or entering full-time employment. What-ever your plans, I wish you the best. The challenging world we live in today is waiting for you to step up and show it what you’ve got. Set your goals now to make a positive difference with your future efforts. Do the hard things. Put in the work, be happy and don’t ever give up on your dreams. Good luck to you all. Clean up dumpsters will be available June 8 and 9 to aid in residential clean up; there will be 3 dumpsters at the Little League Parking Lot and 1 at Town Hall. As always we ask that no trash is left on the ground before dumpsters arrive or after they have been removed. If you have large items that need disposed of please call Republic Services at 628-2821 to schedule a special pick up. These dumpsters are not for disposal of any hazardous waste, chemicals, paint, pesticides, batteries or tires and not for construction site waste. The St. George Re-use Center accepts removed tree limbs and other vegetation for mulching; they are located at 575 E. Brigham Rd, phone # 627-4028. If you do not have a recycling BluCan there are recycling binnies at Gubler Park. Thank you for helping to keep Santa Clara clean and beautiful! The building department would like to remind residents of the importance of backyard and pool safety. Make sure gates in the barrier fence around your pool are self-closing, self-latching and not accessible to small children. Other gates should be padlocked. In-stall a pool alarm, and an approved safety cover on pools, spas, or hot tubs. Check for warning signs of an unsafe deck and make sure repairs are made. Barbeque grills should be away from siding, deck railings and out from under eaves and overhanging branches. Do not use grills in a garage, porch or enclosed area. Keep children away from grills when in use and never leave the grill unattended. Contact the building department for more detailed summer safety tips regarding backyard and pool safety. Have a fun and safe summer! The Home Energy Assistance Target Program accepts applications to assist eligible households in need of help paying their home heating bills. This federally funded program is administered by the State of Utah. Payment amounts are based on income, energy use, and at-risk groups in the house-hold. Residents who wish to apply for assistance should call 435-652-9643 to schedule an appointment. The H.E.A.T. office is located at 168 N. 100 E. Ste. 255, St. George, UT 84770. For many in Utah, the use of fireworks has become a tradition. The beautifully colored sparks fly though the air with thunderous reports. As exciting as this may seem, people are playing with explosive materials, dangerous chemicals and combustibles that can start fires, harm or cause death to unsuspecting victims. These deceptively simple objects explode, throwing 1,200 degrees Fahrenheit sparks through the air. Utah changed its firework laws (HB38) for 2018. Under the new law, fireworks are only allowed to be set off from July 2-5 and from July 22-25. Fireworks may be discharged between the hours of 11am—11pm, except on July 4 and 24 the hours are extended to midnight. Cities and land managing agencies can also restrict areas where fireworks can be set off and restrict their use. Please watch for and abide by any special fireworks restrictions that may be put in place due to dry, dangerous conditions. Please see the enclosed flyer for more fireworks safety information and where fireworks are and are not permitted and fireworks safety tips. The Santa Clara City Fireworks Restriction Map can also be found on the Santa Clara City website at www.sccity.org. Look for the Public Safety drop down box and then follow to Fire Department and Fireworks Restrictions links. Please celebrate safely. Be sure to save the dates for Santa Clara Swiss Days September 20-22. This year’s theme is “Celebrating Traditions”. Come help us celebrate Santa Clara’s rich traditions both old and new alike. You can share your family traditions by participating in the displays to be set up in the Town Hall Banquet Room. We encourage you to gather photo’s, memento’s and whatever items you have that represent the traditions that are special to your family and how you celebrate those traditions. Displays will be set up Wednesday Sep.19th. Please contact us if you would like to participate as we would like to get an approximation of how many displays we need room for. Contact Brooke at sccityevents@gmail.com or the city office at 673-6712 X 201. Of course most Swiss Days traditions remain the same including the Thursday Opening Ceremony and Community Dinner, fol-lowed by a full schedule of events on Friday and Saturday including the Swiss Miss/Mister presentation, Pioneer Hands-On activities, Friday night concert, 5K race, pancake breakfast, best area parade, arts, crafts & food vendors, games for all ages, continuous entertainment , heritage displays and more! There are also great sponsorship opportunities available for businesses that can help gain exposure for your business while supporting the event. 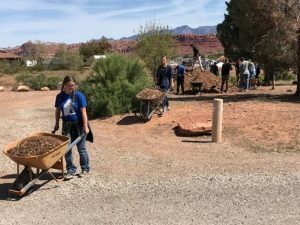 Volunteers: The Snow Canyon Middle Student Ambassadors took a morning from their busy class schedule to provide service to our City. Stu-dents worked at Canyon View Park by placing 30 tons of new play sand in the volleyball court. 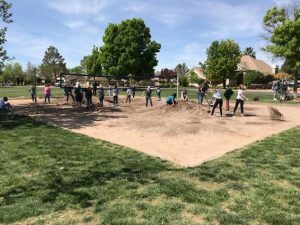 While many students worked away in the sand mountain, other students engaged in moving 2 dump truck loads of wood chips by wheel barrow from the fire pit area to the base of each tree in the park. Each tree received a tree mulch ring to nourish the trees roots and prevent trunk damage from mowers. 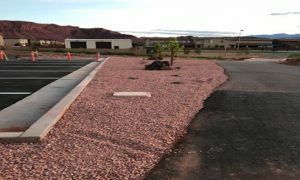 Koby Cook completed his Eagle Scout project by landscaping the Gubler Park Pickleball court entrance between the trail and the west parking lot. Koby created the landscape design, planted 3 trees, installed plants, and added 4” of decorative rock to finish his awesome project. Hello from our Santa Clara-Ivins Animal Shelter. Just a friendly reminder it is already too hot to be taking your animals places and leaving them in a vehicle. In our cities this is an act of Animal Cruelty. 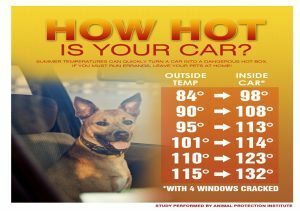 Please leave your pets at home if you know you will be leaving them in a car for any amount of time. NKAS has been very fortunate to have Connie Butterfield as our presi-dent since 2010. She was instrumental in helping convert the Ivins Animal Shelter into a no-kill facility in 2003-2004. INKAS was established to pro-vide community support for the shelter. Under Connie’s leadership INKAS raised funds to support the shelter and the area’s homeless pets. Connie is stepping down as president but will continue to be a part of the team as a director. INKAS is excited to welcome Lois Hewitt as our new presi-dent. We look forward to many more years of dedication to the welfare of homeless animals in the cities of Ivins and Santa Clara. We thank the community for their continued support.